There’s no cutting corners with the volunteer’s first trip outside the safe confines of the Tsinghua University campus. 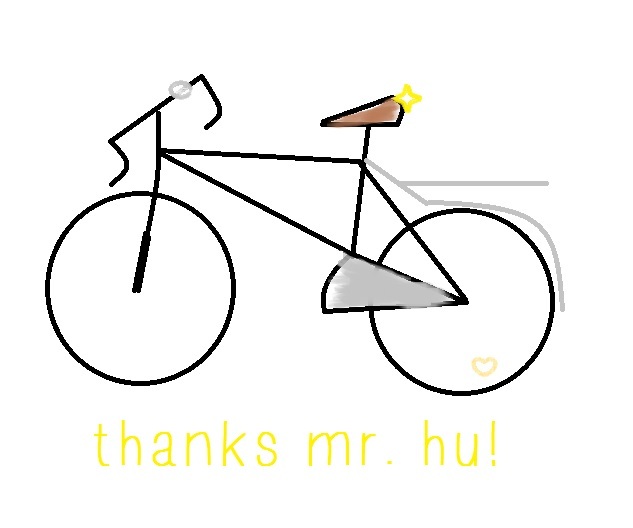 We’ve get ourselves kitted out with bikes, locks and keys from Mr. Hu (Mr. Who?) the local tough-bargaining student-bike specialist (150RMB for three weeks all-inclusive hire) and we set off to the scene of the 1989 Tianamen Square Protests. Check out that surveillance behind us! It’s a typically over cast day, and though I’m starting to wonder if I’ll ever see the sun, I’m fairly glad that I’m out of its rays given the current sticky heat. We chain up the bikes at the gates of the campus (I’m feeling pretty attached to my transportation already…) and navigate the Beijing Metro to unearth ourselves by the quiet of the square. It’s literally just across the dual carriageway, but it’s a five minute roundabout way to the square’s entrance past politely round-topped fences, and when we get there, we share the space with several other Chinese tourists taking happy photos of the surroundings. We’re the only foreigners here, and cause some hubbub by sitting wearily in a circle, resting our sagging jet-lagged backpacks in a pile on the ground. And it’s not long before our presence begins to draw attention. We’re firstly bombarded (although mostly the English looking girls in the group) by Chinese, accents belying their own status as non-Beijing Chinese, and tourists in their own right. We are bemusedly frogmarched into photographs with their children – and them – until a blank-faced khaki guard steps down off his half meter square carpeted block and makes motions for us to move on. Besides our careful tourist chatter of the revolts in 1989, there’s nothing of the area which would which suggest the murders of peaceful student protesters by military police, but the heavy surveillance, strictly marked walking lines and the relative inaccessibility of the square itself, make me feel like we should take the guards direction and move on. Luckily, we bypass President Mao’s body entombed in his mausoleum by the square – and in hindsight I think I’m just as happy with the imagined knowledge of the iconography of Mao himself; certainly the other volunteers relish telling us about it. The City Gates by the square are a jarring palette of red, blue, green on a back drop of grey; flashes of bright colour in a concrete city. We traispe rather tiredly around the gates, somewhat stunned by their looming structures around which blaring taxis and bicycles and motorbikes fight on the dual lane road. In and out of the market streets, taking many breaks on huge two meter square stone blocks that have been in Beijing over four times our live span, and deciphering dubiously translated English information leaflets. I had my first green tea flavoured ice cream today.